The subcompact crossover segment is growing in popularity with countless models that incorporate an affordable price tag, an athletic style, an efficient performance and a wealth of standard features. Even with the rise in popularity, the Mazda CX-3 remains at the head of the class and with the debut of the updated 2019 Mazda CX-3, the Mazda subcompact crossover is more impressive than ever. Learn more about what makes the 2019 Mazda CX-3 in Las Vegas, NV a world-class entry in a popular class. Built on an athletic foundation, the 2019 Mazda CX-3 is expected to arrive at dealerships in the spring of 2018. When the Mazda CX-3 arrives at Earnhardt Mazda Las Vegas, it is expected to be available in three grades – Sport, Touring and Grand Touring. With room for five passengers in a well-equipped cabin, the Mazda CX-3 is perfect for your next family adventure. An updated style will include stylish 18-inch alloy wheels, a bold grille design, chrome trim, Piano Black accents and new LED taillights. 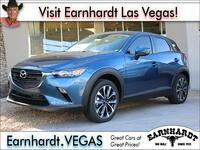 When the 2019 Mazda CX-3 arrives at Earnhardt Mazda Las Vegas, it promises an upgrade in performance that goes hand in hand with impressive fuel-economy numbers. Drivers who opt for the 2019 Mazda CX-3 in Las Vegas, NV will enjoy the benefits and advantages of a direct-injected 2.0-liter SKYACTIV®-G four-cylinder engine that will manufacture 148 horsepower and 148 pound-feet of torque. Armed with a refined design, the SKYACTIV®-G 2.0 engine will improve power and fuel economy. Upgrades to the 2019 Mazda CX-3 powertrain do not end there. Standard G-Vectoring Control technology harnesses engine timing to provide enhanced control over the Mazda CX-3 chassis, which contributes to more accurate handling. When you couple G-Vectoring Control with a fine-tuned suspension and an updated power steering system, the Mazda CX-3 promises an athletic performance that the competition cannot match. Inside the 2019 Mazda CX-3 cabin, you will enjoy a wealth of high-end amenities and an updated style at every turn. A redesigned center console sets the stage when you slide into the driver's seat of the Mazda CX-3 and makes room for wider, more comfortable front seats with more accessible cupholders and a center armrest. An updated dashboard will incorporate soft-touch suede materials and vibrant red accents that are complemented by a 7-inch MAZDA CONNECT™ touchscreen display with Bluetooth and much more. Upper Mazda CX-3 trim levels will now be available with premium leather interior in white or black with exquisite accent stitching. 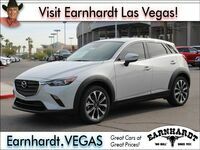 Visit Earnhardt Mazda Las Vegas this spring and schedule a test drive in the new and improved 2019 Mazda CX-3 in the heart of Sin City!